In Florida I grew up with an entirely different type of fig than I have found here. The figs in Florida were ripe when they turned a deep purple on the outside and were so delicious. My grandmother used to make homemade fig bars that were to die for. Here in Washington I found a different type of fig. On one of my picking adventures I passed a house that had a fig tree, but the figs were still green on the outside. Of course, I unbuckle both the kids from their seats, walk up their drive and knock on their door to ask about them. Strangely enough, the woman who answered told me they were called White Figs. 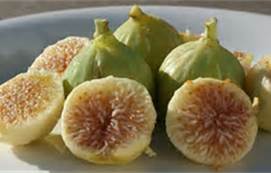 This type of fig is ripe even when it’s green on the outside and the only way to tell if they are ripe enough to pick is if you squeeze them. If they are still hard, don’t pick. She said I could pick a few and while they taste sweet to me, the ones in Florida are still better. This entry was posted in Uncategorized and tagged fig bars, fig tree, food, fruit picking, types of figs, Washington, when are white figs ripe?, white figs. Bookmark the permalink.